Train Harder For Longer. Heighten your physical performance. Maintain training volume and exercise intensity by delaying time to fatigue. Supports exercise performance and power output so you can smash through your training plateau. Beta Alanine’s increase in peak performance comes without unwanted side effects, harmful stimulants or banned substances. Beta Alanine is a pre-cursor for intramuscular carnosine which buffers lactic acid build up to delay muscle fatigue for longer and harder workouts. Helps maintain an optimal pH level in which explosive Type II muscle fibres can perform at maximum strength. 21 Vitamins and Minerals to support nutrient absorption and muscle repair, as well as magnesium to assist with muscle soreness and cramping. 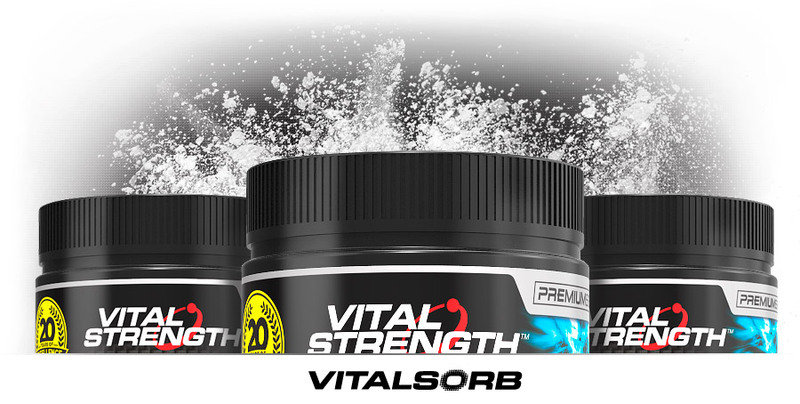 ONLY Vitalstrength uses Vitalsorb Bioavailability, an exclusive manufacturing and delivery system enhancing mixability, ingredient dispersion and water solubility to maximise the bioavailability of nutrients. 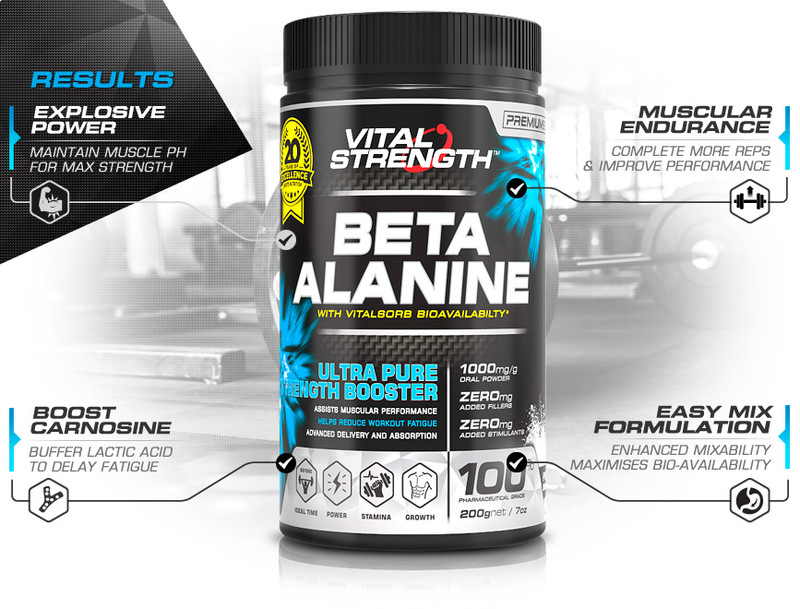 Beta Alanine products are comparable between suppliers with little difference in the core ingredient, however not all products available in Australia are manufactured using certified and pharmaceutical ingredients. 100% Pure Pharmaceutical Grade Beta Alanine. Made in Australia from local and imported ingredients. Smash through your training plateau. Studies show Beta Alanine supplementation may significantly improve exercise performance and power output. Helps improve time to exhaustion during high intensity exercise so you can pump out those extra reps. Potent ergogenic aid in trained athletes. 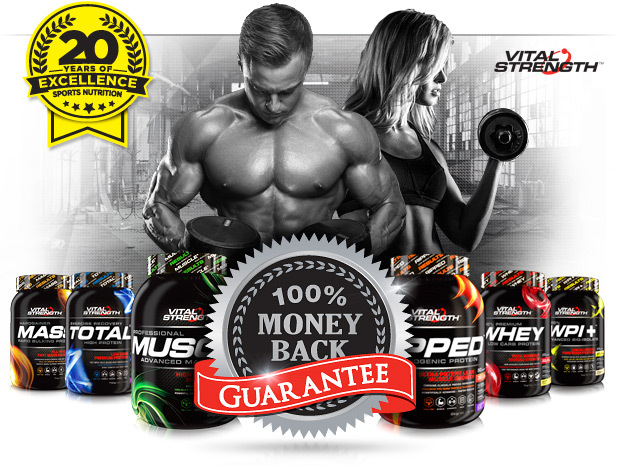 Helps reduce muscular fatigue for heavier and more effective training sessions. HOW MUCH FOR PERFORMANCE INCREASES? Research has shown that taking between 3.2 grams and 6.4 grams per day can boost carnosine levels and improve performance. Current guide is 4 grams of beta alanine a day, with optional 2 week loading phase of 6 grams a day during the first month of use. Mix 1.2g into water or juice and stir until dissolved. Serving size and frequency may be increased for athletes after consultation with a fitness or health care professional. Store below 30ºC in a cool dry place, out of direct sunlight and moisture. Best before date & batch number on base of container. This product is sold by weight - contents may settle.